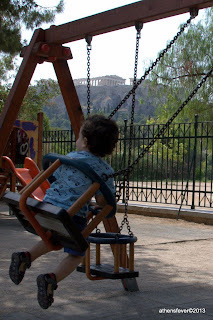 If you are planing to visit Athens with your family, then there are a number of attractions for children that you might consider visiting. We'll start with a list of playgrounds in the center of the city. 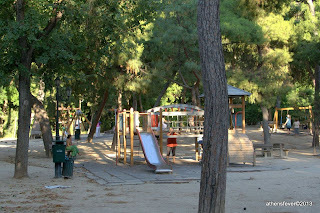 This playground is located withing the National Park of Athens. The big trees of the park shadows the playground providing a safe heaven for children during the hot days of the summer. The park is located in the center of Athens. 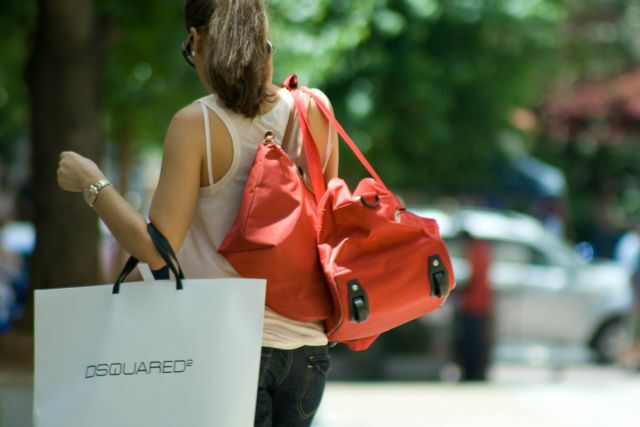 Nearby is the Syntagma Square. This playground has a big jumper mast net for children, and a wooden structure with climbing ladders, ropes, and slides. 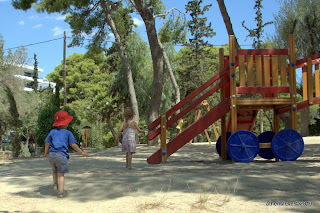 This playground is a few minutes by foot from the Panathenaic Stadium and the National Garden. 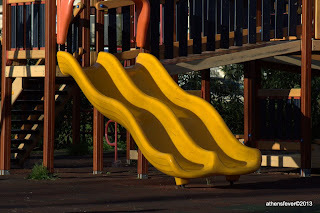 This is a small playground on Apostolou Pavlou pedestrian street. Although it is quite small, this playground has a view on the Acropolis. If you walk further up the Apostolou Pavlou Street from the Thisio Metro Station, you reach the main entrance to the Acropolis and the Acropolis Museum. 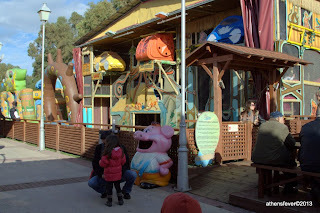 This is one of the Flisvo Marina attraction in Palio Faliro. There is an entrance fee of 5 euros to the inflatable castles. The access for children to the playground area is controlled, so you can sit calmly and enjoy a coffee while your kids are playing. The Fun Park also contains an artificial pond with small swan boats, a trampoline area and a small track with electrical cart cars. Marina FlisvoThis is ideal for the weekend. Indeed the marina with the luxurious boats and yachts, it's coffee shops and restaurants makes this place a pleasant destination for both parents and children. More on Flisvo Marina at the following link. Nearby the Marina Flisvo, there is a park with a two major playgrounds. 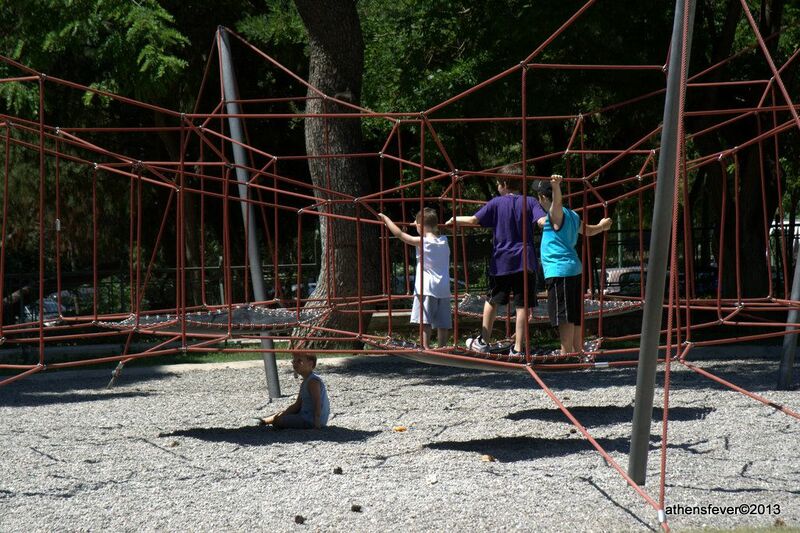 The number of play structures available in these playgrounds is big. There is also a coffee shop nearby with a playground, it has less equipment but is convenable for parents who want to have a drink while keeping an eye on their kids. At the center of the park there is a coffee shop and children playgrounds. The high trees provides shade, which makes this place very popular for among the residents of the area, specially in summer time. Also, the park has one jogging path that makes a 840m (2756ft) loop with a slight elevation range. 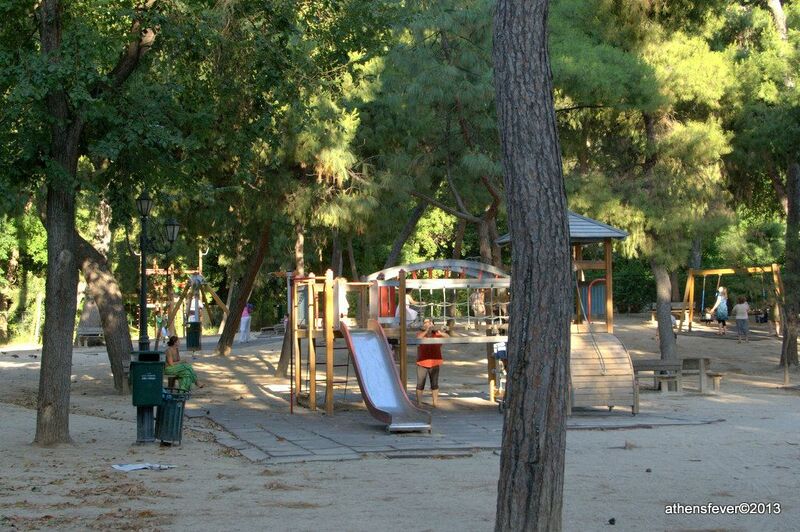 This park with a modern landscape design is located in the Northern suburbs of Athens. It offers for young cyclists short tracks to enjoy off-road access and to work on their skills. The playground has multiple play structures and masts and a coffee shop. However, it lacks of big trees and shade during hot summer days. The main attraction at the Eugenides Foundation is the planetarium. With it’s dome of 25 meters and 280-seat capacity, it is one of the largest and best equipped planetariums in the world. 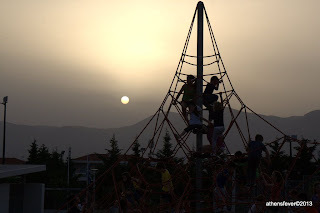 This is a large amusement park in the southern suburbs of Athens. It consists of two separate areas: The first is called Allou Kidom and is intended for small kids. The second area with the consists of attractions for both the adults and children. This is a cultural center where you can experience the Hellenic history and culture through interactive exhibitions and virtual reality tours. Special educational programs for children between 5 and 12 years old, are held every Sunday at the center. The complex in the southern suburbs of Athens comprises of a 210,000 m² Park, and new facilities for the National Library of Greece, and the Greek National Opera. The park is a great place for children with green spaces which includes a sports and leisure park. Every month a program with events such as exhibitions and concerts is published. A lot of these event are dedicated for children, like the sailing event in the canal. The full program can be accessed at EVENTS AT THE SNFCC foundation web page. Among the numerous programs and events of the Onasis Cultural center, some are dedicated for the youth. When available, the programs and workshops for children are announced at center web site at the following link: Youth and Family Programs. The museum organizes during the weekend different workshops for children from 1 to 12 years old. The list of activities can be found at the following link and are subject to a participation fee. The site is currently available in Greek only but an English version is been announced for soon. Aside the organized activities, the museum is composed of different rooms with dedicated subjects where the children can learn and play. There is a supermarket space where kids play buying different food and vegetables products. Another room is dedicated to construction, where the kids are invited to repair a reduced model house with different DIY tools. Some of the rooms contain books and different instructive games. Animators and educators are present in every space to accompany your kids in a world of adventure and discovery. Entrance to the museum is free. Within the large selection of movies played at the Village Cinemas, there is always some dedicated to children. There are six centers of Village Cinemas across Athens and one summer open air cinema at the Zappion Park. The museum original approach is to exhibit artwork of children aged between 5 and 14 years. The museum offers multiple art workshops for children which are held in Greek language only. Workshop duration vary from 8 months to 2 hours. The Playmobil® Fun Park moved recently to a new location in northern suburbs of Athens. The brand new space is very well organized with tables for the parents to sit, and watch their children, while consuming snacks and beverages from the self service cafeteria. The Playmobil® Fun Park is a space with all kind, if not all Playmobil® toys. This is the occasion for your kid to play with one of his favorite themes: Dinos, Future Planet or Knights for boys, and Princess Fantasy Castle for girls. On your way out, the Playmobil® store allows you to purchase one of the toys. This store is specialized in Lego systems. The multi-store at Syntagma Square in the center of Athens, has a whole roof dedicated for children toys. 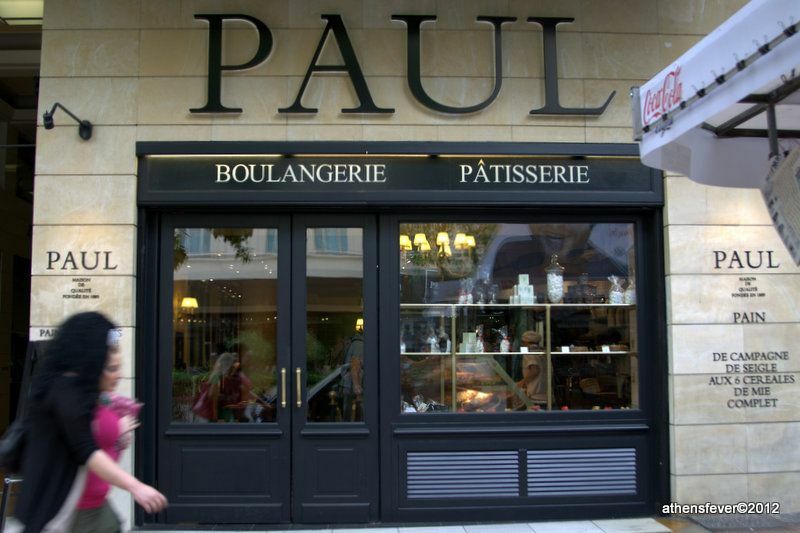 This shop in the center of Athens is specialized in puzzles for all ages. The inventory includes more than 3000 puzzle boxes of well know brands such as: Clementoni, Schmidt, Heye and Educa. Athinorama is a weekly magazine published in Greek that contains all events and happenings in Athens. Their website contains a dedicated page for children events.